Andy Warhol discusses his movie "Chelsea Girls". >>>Andy Warhol seen backstage with Rolling Stones. 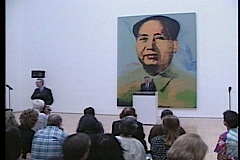 A NEW EXHIBITION OF WORKS BY ANDY WARHOL IS ON DISPLAY AT THE LOS ANGELES MUSEUM OF CONTEMPORARY ART.